6.5 inch speaker has 8 ohm impedance with 6 oz magnet. 6.25 inch diameter. 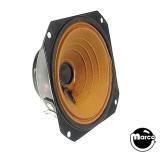 Shielded 4 inch diameter speaker 8 ohm. 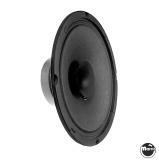 4-5/8 inch diagonal 4 ohm 10 watt speaker used on many pinball machines.